The Ventus S1 Evo K107 is an ultra high-performance tyre that is developed to offer the best of comfort and performance under varied weather settings. It has been crafted keeping in mind improved durability, minimal distortions and to withstand high temperatures. The overall profile and structure ensures optimum ground contact pressure and provides responsive performance at high speeds. Available in various rim sizes, the Hankook Ventus S1 Evo K107 has advanced tread pattern and footprint that helps it curtail hydroplaning, lessen tyre noise and enhance stability. The tyre possesses exceptional dry grip and can withstand against high power output and weight of the high-performance sports coupes and saloons. The Ventus S1 Evo features silica compound which promotes fuel efficiency and provides excellent traction. The tyre comes with rim protection bar which prevents the internal sidewall structure from damage and injuries. The sheer combination of high-density steel belt and nylon reinforced belt equally distribute the footprint pressure at corners during wet and dry handling. The dry and wet braking is excellent and this comes from the combination of longitudinal stiffness of the pattern block and the footprint. 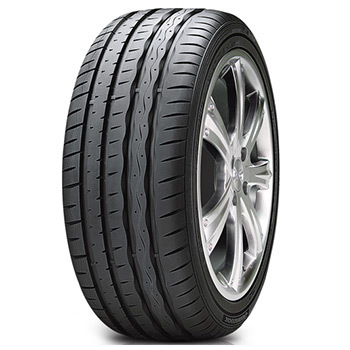 The Hankook Ventus S1 Evo K107 features 3D wave and wide straight grooves on the outer edges and maintains optimal footprint shape, outperforming the conventional tyres. The low rolling resistance enables Ventus S1 Evo to return better fuel economy compared to its rivals. The tyre ensures shorter braking distance and excellent steering response, thanks to the innovative and unconventional tread pattern. The extensive size range of Hankook Ventus S1 Evo caters to an array of performance cars.